One of Myyyyy favorite celebrations is Anniversaries. I am blessed to come from a lineage of long-love filled-Christ loving marriages. So celebrating a monumental moment like a 50th Wedding is something I can't wait to jump on! 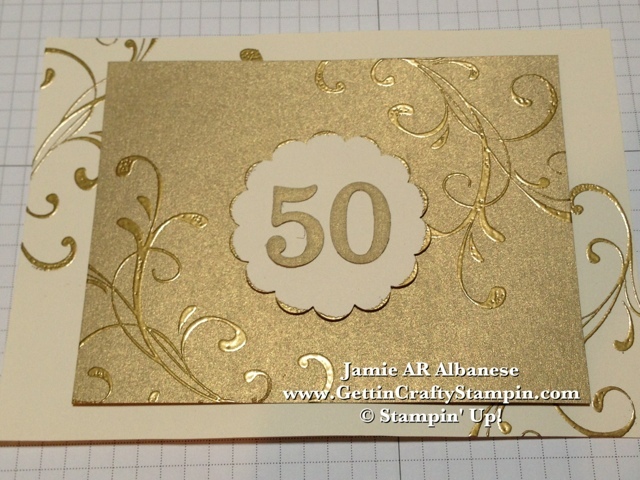 This 5"x7" Very Vanilla card stock (#101650) base is embossed with Gold Embossing Powder (#109129), Versa Mark watermark pad (#102285) and my Heat Tool (#129053). This stunning Everything Eleanor stamp set (#124162) is versatile with elements and nature! When my friend Deliz called and asked for my assistance with a situation, I was curious what she needed. 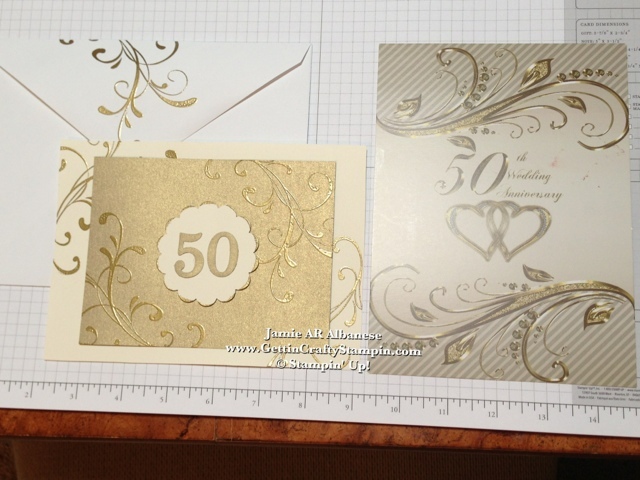 She described the invitations that she ordered on-line, that they looked amazing with raised gold and elegance "on-line" but when she received them they were flat, dull, little elegance or class... especially for her parent's 50th Wedding Anniversary! We spent a little time and visited while building a card that she and her sister actually liked! I love that I had time to do a custom order and help a friend in the process! 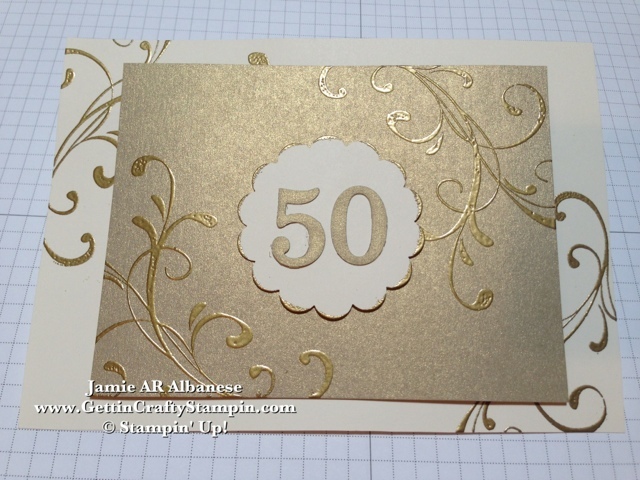 Embossing Gold Powder on our Brushed Gold card stock (#102935) is SUCH an elegant and rich look while being super easy to accomplish! 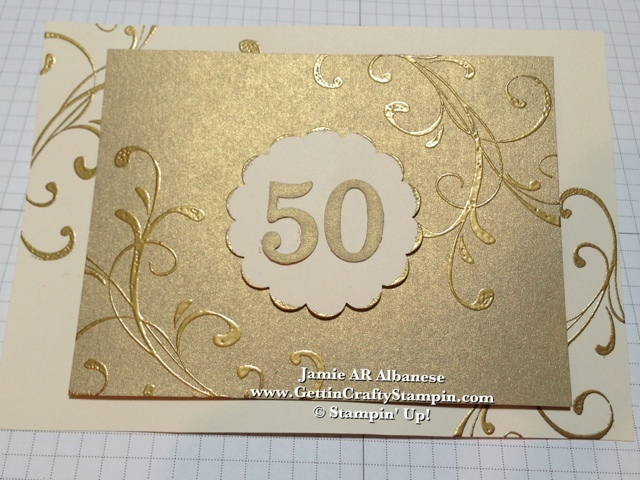 Layering this 'Gilded edged' Gold Embossed 2-3/8" Scallop Circle punched Very Vanilla piece is an elegance base for the Brushed Gold card stock Numbers punched with my BigZ dies (#127553)and Big Shot (#113439). 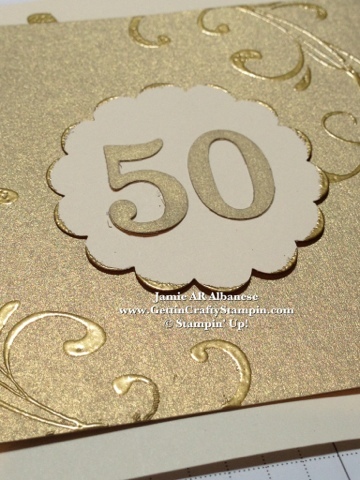 Printing the Invitation on the back and embossing the envelopes is a great way to encourage others to join in on the Celebrations! My favorite childhood memories are wrapped around our family reunion for our extended family from across the nation. I was nine when my grandparents celebrated 50 years of love, overcoming challenges of a lost child, family passing away and growing anew... I STILL Cherish those memories of family, friends & laughter. (My Grandmother passed away shortly before their 70th wedding anniversary - wow!!) I'm beyond blessed by this lineage!! Whom do You Celebrate?? Take a moment and look at who and what you can celebrate, honor and join in on another's achievement. Life is hard, celebrating can bring Joy into it! !